How do you feel about Google sharing your profile in something called Google shared endorsements? 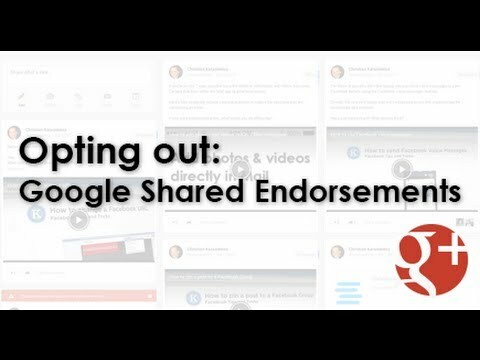 What are Google shared endorsements? Example of Google shared endorsements in product reviews. Shared endorsements are a way for Google to share reviews and recommendations across Google products like YouTube, Google Maps, and the Google Play music store. With shared endorsements, Google will use your Google Plus profile and name when your friends are browsing businesses, products, and websites to help boost recommendations. By seeing what your friends like (and don’t like), this can help bring social proof and influence user decisions. While shared endorsements are a great way to use social proof to influence user decisions, not everyone wants their photo and name displayed though. The great thing is that Google makes it very easy to opt-out of Google shared endorsements. To opt-out of Google shared endorsements, follow the instructions below. Yes, Google makes it that easy to opt-out of Google shared endorsements. Who can opt-out of Google shared endorsements? Anyone under 18 is automatically opted out of shared endorsements. If you are over 18, you need to opt-out of shared endorsements. When will shared endorsements go into effect? Google shared endorsements will be going live on November 11. What information will be used in shared endorsements? Google will use users’ names, photos, and reviews in sites like YouTube and Google. Where will shared endorsements appear? Google shared endorsements will be used in reviews and recommendations on products, websites, and business reviews on YouTube, Google Play, Google Maps. How do you feel about Google being able to use your Google Plus profile information in shared endorsements? Do you feel it’s an invasion of privacy to show your profile and photo in reviews and recommendations? Leave a comment below on how you feel about shared endorsements.